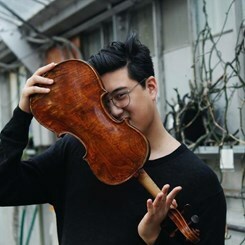 Violinist Jonathan Hwang, A native of Portland, Oregon, currently performs as a member of Symphoria: the orchestra of Syracuse, New York, and the Cayuga Chamber Orchestra in Ithaca, NY. He has been invited to participate in prestigious music festivals such as the Spoleto Music Festival, Aspen Music Festival and School, National Repertory Orchestra, Round Top Music Festival, and the Brevard Music festival. Jonathan holds a Bachelors of Music degree from the Eastman School of Music; where he studied with: Robin Scott, Oleh Krysa and Lynn Blakeslee. Request Lessons with Jonathan Hwang today!